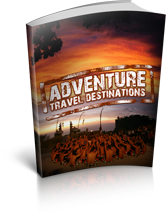 Feel the excitement of adventure tours of the Middle East! Thousands of incredible moments are combined into one exhilarating holiday as you discover a whole new world. Feel that familiar pull of adventure returning? There they arethe Great Pyramids of Giza. From Cairos ghostly monuments to a seaside paradise on the Red Sea, our expert guides will descend into the pages of history and join in you in the exploration of Egypts ancient secrets and its legendary pharaohs. From the grandeur of Abu Simbel and a cruise down the Nile to a dinner with a local Nubian family, the mysteries of Egypt will etch themselves into your memory. Perched at the crossroads of Middle Eastern history for centuries and spiritual home to Jews, Christians and Muslims alike, Israel remains a must-visit destination for anyone eager to understand this dynamic, always-changing region. Explore the historic towns of Bethlehem and Nazareth, tune into the rhythm of daily life in the Golan Heights, visit Bedouin communities in the Negiv desert and experience a soul-stirring visit to a refugee camp. Thousands of incredible momentsone comprehensive trip.